This article first appeared in the Nov/Dec 2009 issue of Feis America Magazine. The gymnasium at the Utah State Feis had been partitioned down the center, the rear half converted into a warm-up and wait room. To my surprise, teenagers in elaborately-sequined solo dresses dominated the dressing areas. Confidence waning, I walked around the room, pretending that I belonged. I began thinking of all the places I would rather be: in my dance school, at home, under a rock. Just as I turned to leave the gym, I spotted a group of ladies wearing class dresses. I looked around the room and found more competing teams. The adults were costumed in dresses and skirts alike, some adorned with intricate knots and embroidery. A few adults were practicing their dances, others were sitting in concentration-headphones blocking out the non-stop accordion music. I glimpsed some ladies who wore the same class dress as me. Walking over to these teammates whom I had never met (they dance at a different location than I), I tried to make eye contact. All of the women were busy adjusting their wigs and checking their programs. I felt as insecure as a newbie entering junior high school. Sweat trickled down my spine, and I hadn’t even warmed up yet. The mock feis my school had hosted helped prepare me for what to expect from the competitive scene, but I wondered what the adults would think of me. Were they cliquish? Did they keep to themselves and shun newcomers? How would my dancing stack up against the adults who had been competing for years? Claiming an empty table, I rummaged around in my bag so that I, too, would appear busy. This is ridiculous, I thought, I bet those adults are nervous and insecure, just like me. “I don’t think I’ve met you.” A circle of dancers stopped fidgeting and smiled at my boldness. Three women and one man introduced themselves and soon we were all relieved to share the burden of tension generated by the competition. Though initial hesitation showed from all of the adults I talked to, a warm singleness surfaced. “I’m hoping to place in my light jig this time,” One of the women confessed. “If I get through my dance without falling on my face, I’ll be thrilled,” another admitted. Soon I noticed that the other adult dancers faced the same fears that I did. Would we place? Would we fall? Would spectators frown on the time given to “older” competitors, or would they accept us as dancers pursuing a legitimate goal? Soon my fellow classmates arrived and I introduced them to my new-found friends. We ran through our soft shoe dances together and lined up for the first dance. The flurry of competition went by like a dream. I leaped and hopped to the music, the smile on my face genuine. As we flew through each event, the faces grew familiar, the smiles more frequent. In between dances, kind words were exchanged and encouragement voiced. A feeling of belonging, of community, wove through the arena, tying us together like the infinite loops of a celtic knot. I found myself at the results table, comparing placings with adults who, a few hours earlier, had been only strangers. When I found that I had placed in five of my eight dances, it felt like icing on the cake. I had gained so much more than medals, I belonged to a new circle of friends. Not everyone found good news or received the marks they had hoped for, but the encouragement and congratulations exchanged were heart-felt. The nervousness of the afternoon had disappeared like a fog at sunrise. I had met adult Irish dancers from all over the Western United States. Some of them were at their first feis, like me; others had competed for years, long enough to own a coveted solo dress. It did not matter that we were competitors. As dancers we shared a commonality that bound strangers together in friendship: a love of Irish Dance. As I packed up my shoes, I waved goodbye to my new-found friends. There is a place for me in this world of adult dancers. Here I can express my love of dance and be encouraged, recognized, and even accepted. Irish dancing, there is no place I’d rather be. Congratulations to Summer for winning the necklace! Send me your contact information and it will be on it's way! Help me Celebrate! Check out my article on Diddlyi Magazine and sign upfor an exclusive giveaway! I am now guest writing at Diddlyi Magazine. 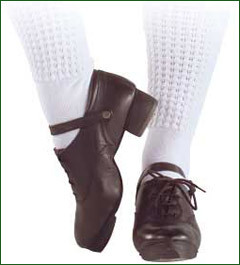 A new section has just been created in their Irish dance section, especially for adult dancers! My first article "Foot Fumbles" was posted on Diddlyi this morning. To celebrate my excitement at working with all the wonderful folks at Diddlyi, I am hosting an exclusive giveaway. Jan at Scrap Crafts by Shan is contributing a fabulous, one of a kind Celtic necklace entitled "Crystal Dream" (see picture). Her handmade pieces are each unique. "Crystal Dream" is made with a silver type celtic knot charm attached to a beautiful moonstone that changes color when moved and is slightly transparent. To gain one entry into the giveaway, leave a comment to this post. For additional entries, promote this giveaway on twitter, facebook, or your own blog/web page, and join my fan page on facebook. Each time you promote the giveaway, leave me a seperate comment in this post. The winner will be chosen using Random.org. My only regret is that someone else is going to win this exquisite necklace and I cannot keep it for my own! This month I became a MAID (Mothers Addicted to Irish Dance). It’s not that I wasn’t already addicted to Irish dance, or that I hadn’t yet been a mother, but for the first time, one of my children began competing in Irish dance. I could be wrong, but I think it is more the norm for a MAID to begin taking lessons as a result of seeing her children dance. Not so in my case. I began dancing years ago and I have so much fun that one of my children has decided to join me. All I can say is that you seasoned MAIDs have been holding out on the rest of us. I never thought I could be happier for someone else’s success than I am for my own. As I sat on the edge of my seat at the Crossroads, Utah Feis (Power Academy) last Saturday, waiting for the results of the Reel Special, I was much more nervous for my son than I ever am for myself. And when they announced my son’s name to receive a trophy, I was so happy that I had to refrain from an impromptu jig! Competing alongside my son opens up a whole new world, one filled with more joy and, yes, more stress than I would ever have experienced had I danced alone. 10 popular ‘trick moves’ in softshoe as a reference list, starting with basics and then working harder. 1-Name: Over 2 3 A.K.A: Jump, Leap, Over step behind. Short Description: Arguably the most common softshoe move, an over 2 3 is a horizontally-positioned jump. Long Description: The dancer kicks their front foot straight up into a horizontal position. The back leg kicks their behind as the front leg is driven up to gain as much height as possible from the floor. The front leg then finally drops back down to the floor. From kicking up behind, the back leg comes to the front and steps onto the floor as well. This is the ‘2.’ The original front leg then steps behind the original back leg, making the ‘3.’ Advanced dancers ‘hold’ the jump in midair for several seconds at its highest point before dropping back down to the floor again. 2-Name: Double Hop A.K.A: Flutter hop, Quiver hop. Short Description: A variation on the basic toe to knee hop where the foot flutters in the air. Long Description: The dancer jumps off their back foot which remains straight, and brings their front foot forward/up until the toe is in front of their back leg’s knee. The front leg is then moved slightly forward and back twice in small quick movements from the knee down, creating a flutter. In essence, the dancer is tapping their toe to their knee twice. The back leg then drops back to the ground after the flutter is complete. 3-Name: Double Leap A.K.A: Trinity jump, Grasshopper, Quiver leap. Long Description: The dancer does a normal over 2 3, however, instead of kicking their front leg straight out, they bring their front leg’s toe to their knee and execute a flutter/double before landing down. Short Description: Changing feet by swiveling behind whilst in parallel. Long Description: The dancer begins in crossed or fifth position. They swivel into a straight foot or parallel position (so that the feet are side by side) and in the same fluid and quick movement, bring the original front foot to the back while recrossing the feet. Usually done several times in quick succession. Short Description: Both a hard and softshoe move, rocks involve the ankles moving from side to side whilst locked to create an illusion of breaking (or not even having) an ankle. Long Description: The dancer places their feet right next to each other but crossed over (that is, the right foot is crossed to the left side of the left foot and vice versa). Raised onto their toes, the dancer uses their ankles to rock over to the side where the back foot is situated. The front foot is rolled over so that the side of the foot is completely touching the floor while the back foot braces it. This is repeated two or three times, rocking to one side and then the other without changing the neutral position of the feet. 6-Name: Clock Turns A.K.A: Point turns. Short Description: A move involving a quick turn of 90 degrees. Long Description: The dancer begins in crossed position with their right foot pointed in front, the front of their body facing an imaginary ‘12 o’clock.’ Their right foot is then brought up to kick behind whilst they swivel on their back foot 90 degrees until they are facing an imaginary ‘3 o’clock.’ At 3 o’clock, the right foot is brought back down into a point in front. These can be done several in quick succession, and also anti-clockwise with the left foot pointed. Short Description: Originally a ballet move where the feet are changed and changed back again in mid air. Long Description: The dancer jumps off of both feet into a straight jump. Whilst in the air, they swap the front foot behind, and then swap it back again before landing down on both feet again. Short Description: A straight-legged turn in mid-air named after a famous figure skater. Long Description: The dancer jumps off from one foot, revolving 1 and a ½ times in midair. During midair they swap feet (in hardshoe the heels are clicked during the swap) so that they land back down on the opposite foot to the one they jumped off of. Long Description: The dancer executes a small straight jump in crossed (fifth) position. They then swivel their heels out so that their feet are in an inturned position with their toes slightly overlapped. They then slide the front foot behind the back foot and swivel back into a normal, crossed position. Short Description: A new and very popular jump involving kicking up behind three times before landing down, creating the illusion of riding a bicycle. Long Description: The dancer takes off into the air from their left foot, first kicking up behind with their right, then their left, and then their right again. During all three kicks, no foot should touch the floor again, hence they must be done in very quick succession with the foot falling only halfway back to the ground before coming up again. The dancer finally lands down on the same foot they took off from after the third kick up behind. Naturally, the left foot can be swapped with the right in order to do the move on the other leg. Irish dance-Only for the Kids? So I am trying to research the history of adults in Irish dance. What I am finding is a startling lack of information. Any literature I try to get my hands on is no longer in print or just plain hard to get a hold of. I’ve gone online and asked around to see what other ID’ers know about adults in Irish history, and the results are conflicting. Some people say that Irish dance has always been for the kids and only recently have the adults come out of the woodwork. 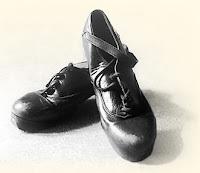 Others have mentioned that up until the advent of competition and the advantage of beginning at a young age, Irish dancing had been a cultural pursuit mainly for adults. Most do agree that the latest batch of adult enthusiasts appears to stem from the Riverdance craze that began in 1994. You may wonder why I even care about how adults danced in the past. The answer is simple: we can learn how to bring about positive change in the future by examining the past. I have only been Irish dancing for a few years, and I would like to know where the journey could take me. I know what I want to accomplish in the next few months, or even a year or two down the road. But I am a dreamer. I want to know what is possible. Can a dancer compete at the World Championships as an adult? Does that mean she will have to compete against her teenage daughter to do so? Could adults eventually have their own categories? Performance such as Lord of the Dance, will they consider adults? Is it possible for adults to brainstorm and find new outlets for their love of dancing? If the world is a stage, I don’t want to be in the audience. Having a few more birthdays won’t hold me back from pursuing what I am passionate about. My question is not simply what can I as an adult Irish dancer do, but what I can become? This article first appeared in the Sept/Oct 2009 issue of Feis America Magazine. My stomach lurched when I saw the judges at tables near signs reading "Stage A" and "Stage B." I hadn't been this nervous since dancing in high school. Walking past the vendors at my school’s “mock” feis, I headed backstage. Dancers of all ages and sizes were adjusting dresses and lacing ghillies. Looking down at the white shirt and black skirt that marked me as a newbie, I wondered if I should compete. Who was I kidding? As a mother of five, I should be running kids to soccer, not prancing around a stage. Maybe I could sneak out the way I came in. I turned around and ran into a class mother. "Here's your number," she said, handing me a paper with the number one on it. I smoothed my shirt, feeling exposed and self-conscious in my bloomers and short skirt. If only I had lost ten pounds before this event. Slip jig, single jig, light jig - the names of the dances jumbled together in my head. Would I remember each dance while the competitor next to me did something completely different, in front of people who were looking for my mistakes, all to music I had never heard before? I panicked. Peeking out at the crowd gathering by the stages, I saw my son waving a camera at me. I felt better having loved ones cheering me on. Soon, it was time for my first dance – the beginner reel. Standing with my feet crossed, I tried not to lock my knees. Younger girls reeled in front of me. The floor felt slippery. A new worry surfaced: what if I slipped and fell? Before I could explore that lovely thought, I was counted in. Remembering to smile, off I went. My legs took over, recalling what my brain could not. My body did exactly what I had practiced and no more. I resolved to make it through the dance, crappy technique or not. After thirty-two bars, I was bowing to the judges. I had competed in Irish dance for the first time! Backstage I eagerly pumped my friends for their experiences. "Did you make it through?” I asked. “You didn't fall, did you?" But before I could find out much, it was time to dance again. Everything ran smoothly until the last eight measures of my single jig, when the music came to a dead stop. "Step step, leap 2, 3..." I counted out the steps in my head and ended with my feet crossed tightly. To think that I had worried about dancing to new music - I had just danced in silence and still remembered my steps! My confidence didn’t last - hard shoe was next and my chest tightened with nerves. I felt like a mule at a horse race. The floor felt more slippery and I prayed that I would stay upright. Miraculously, the dance went smoothly - until the end. Down I went, legs in the air. A collective gasp echoed through the room and I scrambled to my feet. I didn’t have time to dwell on my slip-up; I had to line up for the Hornpipe. It was the least polished of my entries, and I hadn't gotten to practice it. My insides twisted tighter than a Celtic knot. While I waited in line, I walked through the dance and successfully recalled all of the steps. With one deep breath, I headed for the stage. Pulling determination out of my emergency reserves, I counted myself in. Believing that I would remember all of the steps, I gained confidence. I should have kept my thoughts on my feet; one second I was gliding along easily, the next my mind was blank. I had no idea what came next. I looked at the girls dancing onstage next to me, but they were doing different dances. I was lost. I don’t know what happened next; I assume I repeated the basic steps until my counts were up. Embarrassed, I bowed and snuck back to the warm-up area. My friends encouraged me to forget my mistake and keep going. It was good advice, but hard to follow after messing up in front of people who were already judging me for my lack of youth and experience. Nevertheless, with my hard shoe dances over, I sighed with relief. After one more dance - a two-hand reel that repeated steps I had competed with earlier – I was done. "I enjoyed watching you dance out there," said a woman backstage. "You caught my eye. Nice job." I thanked her, surprised at how good a casual compliment could feel. I had done it. I, an over-thirty adult, had competed in an Irish dance competition. Sure, I had forgotten a step here, a dance there. I had even fallen on my behind. But I had pushed myself to leap out of my comfort zone and challenge myself. Confidence kindled in my heart, igniting a desire to practice harder and develop my talent. I wondered: how would this practice feis compare to a real competition? Give me a few months to practice and I'll find out. This article first appeared in the June/July issue of Feis America Magazine . “I bought you tickets to a dance show,” said my husband as he handed me Riverdance tickets. We had never heard of Irish dancing before, but he knew I would love any dancing event. The night of the show I fidgeted with anticipation, unaware of the vibrant world I was about to enter and the effect it would have on my future. Haunting flute music filled the theatre, and I held my breath as dancers drifted onto the stage like ethereal creatures. My heart pounded with their feet in a rhythm of longing that would not be quieted. When the curtain dropped, I yearned to maintain a connection with the song and dance. For weeks, I couldn’t stop thinking about Riverdance. I listened to the music and researched the show’s roots, wishing I had known earlier about it. My husband mentioned that it would be fun to learn to dance like the Riverdancers. That got me thinking: could I learn to Irish dance? As I considered taking dance lessons, obstacles surfaced. I was quite pregnant with my second child, so dance instruction would have to wait. I would need money for lessons. I hadn’t danced since college; my muscles and technique were rusty. And in my mind lurked the thought that I couldn’t dance and be a mom too. After a year of debate, I took informal lessons from a local teenager. I enjoyed the basic movements taught, and the class fueled the ambition that ignited when I had first watched the Riverdancers. I found an adult class whose doors were open to anyone. Lacing up my ghillies, I soaked up every dance my teacher introduced to our fledgling class. Attending a weekly night class while my children slept required less of my family than I had feared. After learning several dances, I realized that it wasn’t enough to practice them; I wanted to perform. My school offered a performance group, but only for children and teenagers. When I learned that adults can compete in Irish dancing, it didn’t take long to find a certified teacher in my area. Armed with a bag full of shoes and a mind full of questions, I began my journey to competition. The satisfaction obtained from hours of training and focus was expected; the myriad of benefits that resulted were a bonus. I found that even thirty-somethings can pursue dance and be taken seriously on the Irish dance stage. I have gained strong friendships, my technique is improving, and my baby weight is disappearing forever. My quest has even inspired my children to find dreams of their own. I know there will be sacrifices as I balance a family of seven with my renewed pursuit of dancing. Finding time to be a soccer mom and practice my light jig will be tricky. But with a supportive family and a commitment to rearrange my schedule, I am confident that I can be a loving mother and still succeed in my ambition. Who says you have to hang up your ghillies when you turn eighteen? No matter your age, you can dance your dreams. My two-year-old daughter may be tiny, but she is not too young to inform me that she is going to dance when she “gets bigger,” just like her mommy. The ladies in my adult class may have decades of life experience, but they are not too old to get in their clicks. Come along; experience the world of Irish dancing with a new adult competitor. My first feis is only months away and I can’t wait to experience the thrill of performance. Share in my struggles and success as I don hard shoes and treble down a fresh pathway to my dreams. This article first appeared in the June/July 2009 issue of Feis America Magazine . This article first appeared in the April/May 2009 issue of FeisAmerica Magazine. In my role as a stage mother, I like to think I am the encouraging type. I am not the other type, you know them, parents who hover over their star child, pushing them to pursue the dream they never accomplished. I love my child as he is, encouraging him to chase his own dreams, giving him freedom to choose those dreams without my influence. If he wanted to stop dancing, I would let him in a heart-beat. I think. Friends who know of the passion I had for dance in my younger years laugh when they hear I have a son in dance. “You signed your son up for ballet?” The real meaning of their accusation is clear-you love dancing so much that you forced it onto your unsuspecting son. The truth is, my son asked me for dance lessons when he was still in diapers. Each Tuesday as I put him into bed, he would ask me to take him to my adult Irish dance class. Tucking his blanket under his chin, I told him that it was a class “just for mommies”. After this went on for more than a year, I asked him if he wanted to join a dance class for kids. Ballet and tap ensued, followed by a love of Irish dance that we still share. My little boy initiated the dance lessons and I encouraged him to follow his interest. Now I peer through the viewing window at class to see if his form is correct. Is he pointing his toes, are his hands straight at his sides? Is he focusing on what the teacher is passing on to him? The emotional ribbons that tie me to dance are interwoven with how I feel about my son’s first hobby. At performances I beam with pride and have visions of him trebleing to fame, placing at Nationals, even being asked to join the Riverdance troupe. There is no limit to how much he can achieve, I think to myself, if he works diligently towards this dream I have for him. I bought him a ticket to see Lord of the Dance. My intentions are noble. I plan to expose him to the expertise of professional male dancers…and secretly I hope he will be taken in by the music and dance, as I am. He shows a genuine interest and talent for Irish dance and I want him to love it as much as I do. As he hop-two-three-d to the next room, my mouth hung open in painful realization. I am more attached to my dream of his success than I realized. Perhaps we are all stage parents. We age, we acquire families and full-time jobs, and, for some of us, our dreams are put away. Those of us whose dreams are cut short won’t allow them to die, and it is all too easy to project them onto our children. Most mothers and fathers encourage self-confidence and growth through the activities their children participate in. Perhaps they even secretly harbor a belief that their child could be the next Jean Butler, or Michael Phelps, or David Cook. Parents want their children to experience success. I wonder then, can I let go and allow my son to pursue his own dreams, unhampered by the ones I cling to? The answer, I find, is surprisingly simple. It is a matter of allowing myself to live those dreams that I believed were lost with my youth. My desires to motivate my son and my need to follow my own dreams can go hand in hand. When I pursue my own talents and ambitions, he observes my dedication; he notices the drive with which I pursue my interests. When I allow myself to reach for those dreams I had almost forgotten, he is encouraged to struggle for his own visions of greatness. I will be the kind of stage mother every parent wants to be-one who shares with their child a love for life and envisions his/her ultimate potential. I’ll have no regrets if my son chooses to dance, or to play ball, or to be a musician. This stage mom will be there cheering him on regardless of the venue. After all, dreams are fulfilling only when they can be shared with the ones you love. Dusting off my ambitions will be a satisfying challenge. Who knows, I may even develop new talents. Kung Fu, here we come. Mairead Hewitt, one of the founder Members of An Comhdhail, passed away on August 24, 2009, two weeks after celebrating her 100th birthday. Prior to her death, she was the oldest Irish dance teacher and adjudicator in the world. On her centennial birthday, Michael M Fennell, Chairperson of the Dublin Branch of An Comhdhail, asked Mairead, "What was the secret of her continued long life?" To which she replied, "I looked after myself and never spoke ill of anyone, so avoiding any stress or unnecessary worry. It's most important to be happy". Mitsi Fink, an adult dancer from New York inspires other adults to compete. She began competing in Irish dance at twenty-five and has since dropped down to compete with the younger dancers. “Dancers should really try to dance with the music and really get into it,” she points out. “That’s definitely a skill that’s hard to achieve.” You can read the entire article at irishcentral.com. What’s your opinion on wigs for adult dancers? As you know, I am a newbie in the world of Irish dancing and I haven’t decided whether or not to wear a wig in competition. I hear a lot of conflict on this topic. Some people say the judges won’t take you seriously if you are without the bouncing curls, others disagree and point out that some judges are annoyed by adults who wear a wig. I’ve read that some people think a ponytail or lighter weight wig is easier to dance in, but there are some who think it looks ridiculous on an adult. So tell me, what’s your attitude towards the curly stuff? Go wig or go natural? Ushering in the dawn of a new age. The future of the adult Irish dancer has never shown brighter. As more adults flood the arena, we are bound to get attention. 1-Adults in &overs could become an acceptable norm. The more adults who drop down to &overs, the more we will be taken seriously. 2- An Coimisiún could decide that adults are worthy of their own Championship levels and edit the rules accordingly. Can you envision how either outcome would be a step in the right direction? Now how can we hasten the dawn of a new age for adults? Spread the word of this wonderful world to other adults. Encourage those adults who dance with you to set their sights high in competition, or to begin competing in the first place. Let others know how wonderful it is to be a part of Irish dance, a world where adults can dream and work to bring those dreams to life. After all, Irish dance is a place where, truly, age is only a number. Working will win when wishy, washy, wishing won't. My greatest fear is that when I die, I will look back in my life and say, if only. I doubt that I will say, if only I had watched more tv, or if only I had checked my facebook account more often. The if only’s I regret will reflect the relationships and the talents I should have spent my time nurturing. I don’t know about you, but I find myself having to constantly defend the time I set aside to dance. Not only do my family and friends vie for every second of the day but, surprisingly, I can be my worst enemy. Even when I get into a rhythm, I find myself squandering away my precious time. It’s too bad, really, because I know that only practice will help me improve, ultimately helping me perform better and feel good about my placings at feisanna. So, why do I freely give away the time allotted to bettering myself? I think it’s all about focus. 2 I am not motivated enough to take action. Whether lack of motivation or ignorance is at the root of your own problem, you will find it beneficial to reevaluate. If you love dancing, but you cringe when a friend asks you to show them what you do, perhaps the dancing itself is your ultimate goal, and not the performance. On the other hand, if you work out a jig in the grocery store, not caring who sees you, performance or competition could be a better outlet for your creativity. Once you have decided on a goal, brainstorm some ways that you can reach it. Think specifically: what do I need to do to reach my goal? Break larger goals into small, manageable steps. You want to go to Nationals? Slow down and eat that elephant one bite at a time. You would rather perform with your local dance school? Decide what it takes to do so. Then commit yourself. Write down a specific goal that you want to work towards. Are you having a hard time making it to class? Change that. Set aside the time and do it. Do you want to advance to novice in your hornpipe? You know what it takes, now do it! Go ahead; give yourself the freedom, the permission to reach your goals. Don’t let distractions or even others who may not support your goals get in the way. If dancing is important to you, set aside the time in your life to get it done. Life can be busy, with so many things competing for our time and attentions. Discipline yourself to know what you want, to list what it takes to get it, and then commit to put your plan into action. Don’t be afraid, give yourself permission to dream and then get to work bringing that dream to reality. One of the challenges I face as a “mature” dancer on the Irish scene, is getting my body off the ground. When I danced ballet as a teenager, I thought nothing of leaping through the air as light and graceful as a kite on the breeze. Years of pregnancies and childbirth have taken its toll on my body and I have to work extra hard not to imitate an elephant when performing a “light” jig. I have to admit, when I watch others compete or perform in Irish dance, my eye is drawn to the trim, thinner dancer. She is better suited for the kicks and leaps than my padded frame allows. It’s frustrating, the skinny me that still lurks beneath the surface remembers what it was like to dance with less restriction. Luckily, the very fact that I am dancing moves me in a positive direction. The more I dance, the more calories I burn. The more calories I burn, the faster those fat cells melt away, revealing the skinny me that is still lurking beneath the surface. That weight-less feeling is liberating, a way of severing the ties gravity has to my body. Gonefeising.com is a place for Irish dancers of all ages, including those who have found this passion later in life. Please be patient while the site is under construction. Enjoy your stay.